Deep in the heart of Lisbon there was a woman who laid out her finery on a bright table cloth and played her harp to attract passers-bye to come and sit and enjoy a meal. Many said that those who sat at her table left changed by a loucura. They called her witch and warned people that she must have a special stew. A young captain from the civil ministry came to question her, he wanted to know what she thought she was doing. From her front step, she explained she was only a harpist that enjoyed the company of strangers and stated her innocence and love of civic duty. Upset by authorities she played a melancholy urban tune of a girl who’s heart was trapped in an oak tree in a wheat field who could love no one even though she desired it more than anything. But the woman was not to be left alone for her insolence and her home was stormed in the middle of the night. As her door was broken down and the soldiers rushed in to capture her. It is said that they found a black cat perched on the kitchen window sill and a pot simmering on the stove. The table decorated with carnations. And as everyone knows, an army travels on it’s stomach. The soldiers sat at the table to enjoy the stew. Cut and marinade the pork in the wine garlic paprika bay leaf and pepper to mingle the flavors of freedom. When the time is right, strike! Remove the pork from marinade and pat dry holding the juices of revolution in reserve. Set the onions and garlic to a hot pan as you would a traitor in your midst. Sear them golden brown and savor like sweaty lovers on a terrace. Feed the pot, tomatoes and crushed chillies to show what the color of passion is, then add the marinade so it may simmer. For 2 hours under the cover of a lid let the ingredients lay. And when the pork whispers tender, season with salt and bring to a cacophonous boil again! 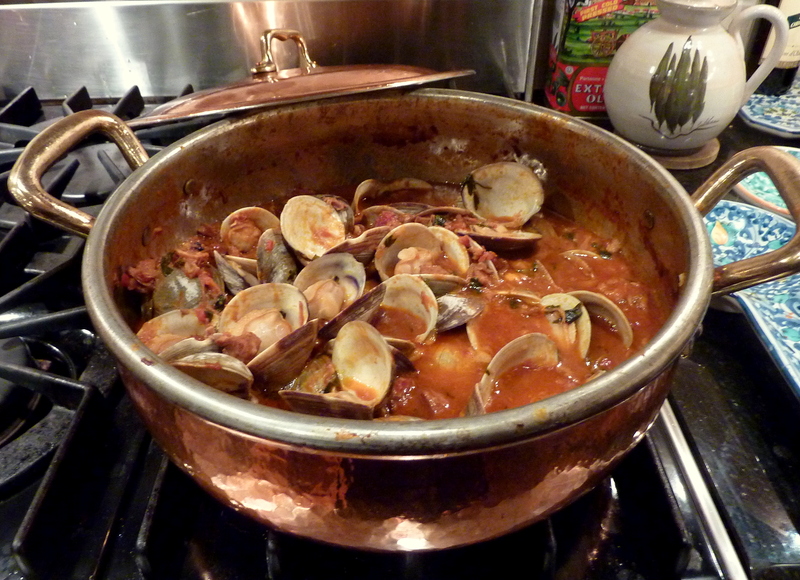 Toss the clams in to bleed them of their liquor and when they are open like a lovers legs…sprinkle with parsley and serve.